Nudged was released one year ago today. I though today would be a good moment for an update on where we’ve been. The premiere was at the Corral Theater on Thursday, May 14, 2015 and May 15 was the official release date. Following on the heels of the Memorial Day Flood two weeks later, Nudged was shown at a fund raiser for flood relief. Nudged was shown at the Lantex Theater in Llano in September and at the Odeon Theater in Mason in October. Nudged has been entered in 19 film festivals (mainly in Texas). So far no one has invited us to participate and we are waiting on 6 to make their decision. Nudged is available for purchase or rental from Amazon Video. I am grateful to the actors, crew and community members who supported this production. Nudged shows off our village of Wimberley and tells an interesting story. Many more people will discover our Hill Country gem in the coming year. These photographs of the LanTex Theater in Llano are real. Nudged will be shown tomorrow at 7:30 pm. Inside the theme is gold and this wonderful Art Deco bas-relief sculpture hangs above the concession stand. A sneak preview was held for the cast & crew on Sunday, April 12, 2015. There were about 50 people involved in the making of Nudged and over 30 attended the preview. 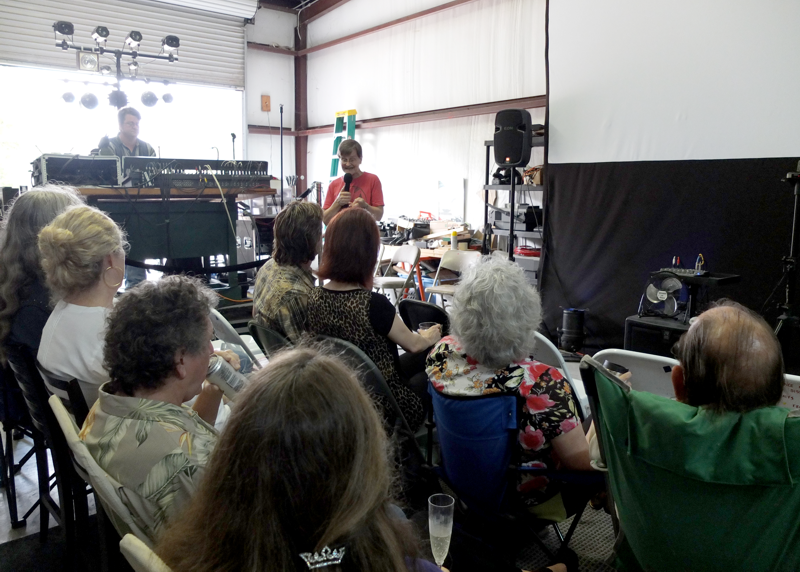 The preview was held at Jason Marion’s business, The Audio Dojo, in Wimberley. This is a rehearsal space featuring state-of-the-art sound reinforcement facilities. It also has a projection screen that is 12 feet wide. Notice how no one was willing to sit in the front row. They were spread out along the back and outside of the photo. We all thought the film was brilliant and the outtakes reel was a blast. Next up is the World Premiere. Stay tuned. I have a rough cut of the whole film. It’s 96 minutes long without credits. Jason has a copy and he is timing out the score. I watched it yesterday for the first time as a complete movie. I have a page of notes. The audio is still rough, there are errors to correct, special effects to polish, a few B-roll inserts needed, and final color correction yet to be done. Overall, I like it. Watch for both an actors/crew only viewing coming soon and the premiere coming when it’s all final and complete. Below is the editing software at work. On the screen are scenes 35 through 49. Each little vertical line is an audio/video clip with audio-only clips at the bottom. 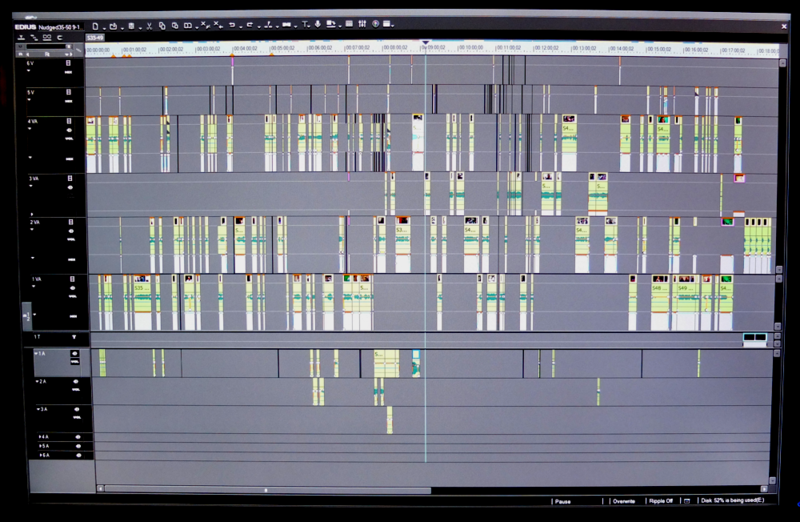 That’s what 17 minutes of the movie looks like from the editor’s viewpoint. Purchase the DVD from CreateSpace. Use the discount code - VZ6V4T98. Get streaming rental to your TV from Amazon Video.